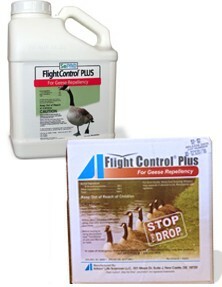 Flight Control Plus works in two ways to rid the area of geese. Geese experience a temporary but very effective digestive irritation when they eat your turf. Geese can see (Invisible to humans) turf grass that has been treated with Flight Control Plus. Within one to two days Geese will associate the visual cues with the digestive response and seek alternative feeding areas. This is a concentrated product; a small amount goes a long way. One gallon is typically enough to last most homeowners a season or two. Great for lake and pond backyards, athletic fields, parks and golf courses too. This product is non-toxic and biodegradable it is safe for people, wildlife and domestic pets. Apply when turf is dry. 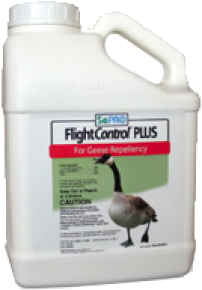 Rainfall does not affect Flight Control Plus. Amount of Repellent required: 7.5 Ounces of the concentrate mixed with water. Extreme bird pressure - you can use up to 15 Ounces. Amount of Repellent required: Two Quarts (1/2 Gal) of the concentrate mixed with water. Extreme bird pressure - rates of One gallon per acre can be used. *Consult Label for Exact Doses & Important Application Directions. The Flight Control Plus Product Label is available for download in pdf.